Traffic-Lights Steamed Cupcakes Recipe. Ever since my twins tots turned 13 months, they became picky over their food. On one hand they are learning to be independent, trying to do self-feed, on the other hand, they have a sharper taste buds than before, always prefer our food than theirs. Hence, to entice them to eat food that is suitable for their age, I have been experimenting and cooking a variety of tots food. Low or no salt, low or no sugar and as natural as possible are the guidelines of all the recipes I have came up for them. When offering new food to babies and tots, do watch out for potential allergy reaction. 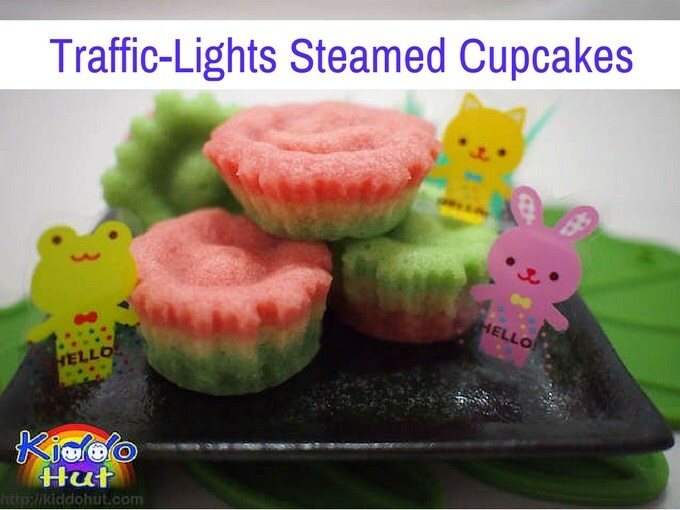 This is their new favourite – Traffic-Lights Steamed Cupcakes. There is no baking powder nor baking soda in the ingredients and all ingredients are natural. It is great snack for tots! And, you can teach your kids about traffic lights 🙂 Do note that as it doesn’t have baking powder nor baking soda, the cupcake doesn’t rise so do not expect a ‘rising’ cupcake. 1. When folding in the flour and coconut milk, do not throw in all the flour at one go. Alternate the 2 ingredients in small amount when folding to ensure well mix. Start and end with flour. 2. To release big bubbles from the batter, you can either bang the batter on the tabletop or just use a toothpick to release it. 3. Stir the batter a bit before spooning into the lined cupcake moulds to release the small bubbles. 4. To prevent water condensing onto the cupcake while steaming, wrap the (steamer’s) cover with a cloth. The one I used was bought from Daiso. 5. Fill the steamer with enough water. It is not recommended to refill the water in the steamer during steaming as it will affect the temperature therein. 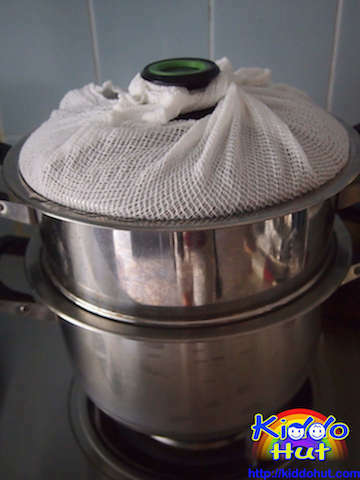 But, if your steamer is drying and you really need to top up the water, add hot water. 1. Whisk the eggs, sugar and vanilla essence using medium speed (approximately 10 minutes for my mixer) until the mixture is thick and pale in colour, until ribbon stage. 2. Meanwhile, prepare the steamer and line the cupcake liners in the moulds. Put the cut pandan leaves in the water for steaming. 3. Fold in the cake flour, salt and coconut milk in small amounts until it is well-mixed. Alternate flour and coconut milk in folding. Start and end with flour. Do not throw in all the flour at one go. You can either use spatula by hand to fold the mixture or the mixer. I used the mixer in low speed and a spatula to ensure all the flour has been mixed in. 4. Divide the mixture into 3 equal parts. 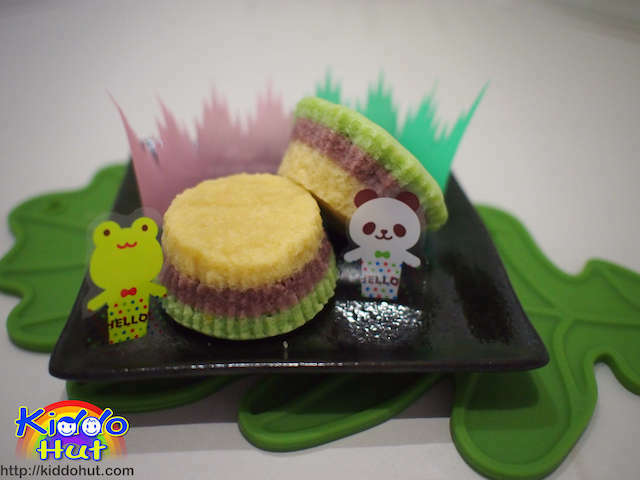 Stir in pandan paste / essence in one portion and stir in rose syrup in another portion. The third portion just leave it plain. If you do not have rose syrup, you can use the red colouring instead. See my post on how to make pandan essence. 5. Spoon the green batter into the lined moulds to fill slightly less than 1/3 and steam for 5 minutes under high-medium heat. Repeat with the plain batter followed by the pink batter. 6. Steam the cupcakes for another 18 minutes or until a toothpick inserted into the centre of the cupcakes comes out clean. 7. Transfer the moulds from the steamer to a cooling rack. Serve warm. If you keep in the fridge, you may warm it by re-steaming for 5 minutes. You can have different colours combination depends on your preference. Additional note: If you are serving eggs for the first time, do watch out for potential allergy reactions. And, it is not recommended to give egg-white to kids below 1 year old.